At least one night per week (but more likely two or three), I get home from work, tired and wanting to do nothing more than veg out in front of the TV and order delivery. Usually, however, I manage to muster the energy to cook dinner because I know I can make something that is much healthier for my family in less time than it would take the delivery guy to show up. This is one of my go-to quick and easy weeknight dinners that can be ready in less than 30 minutes. Most of the ingredients are staples that I try to keep stocked in my kitchen. 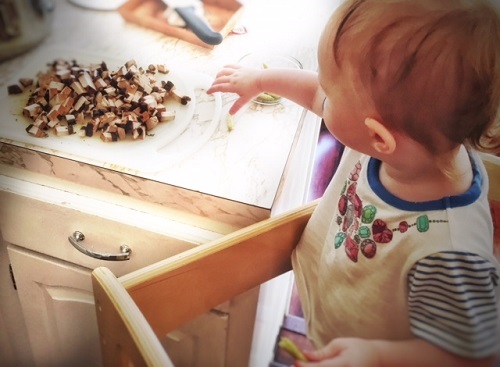 Plus, Maddie can hang out with me in the kitchen, and be my taste tester from her Learning Tower (read here about why I love her Learning Tower so much! ), a great way to get her involved in the kitchen, and excited to eat. 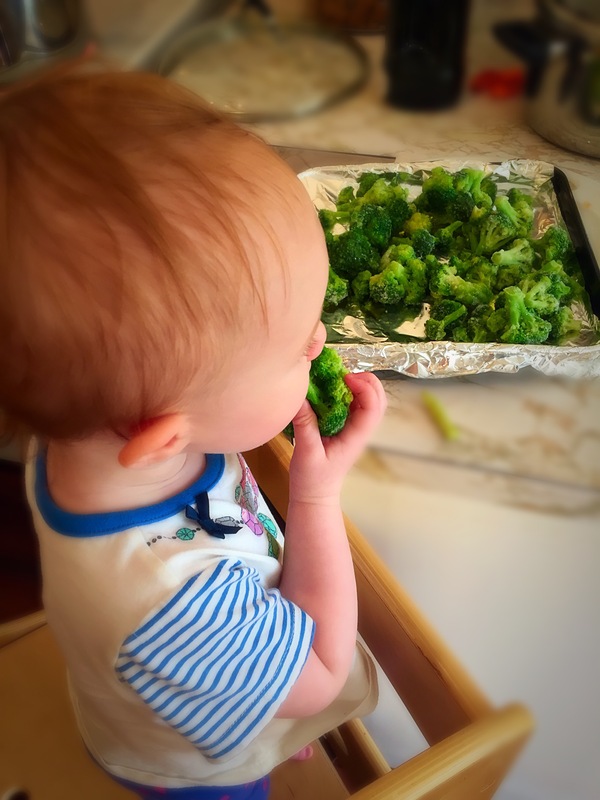 This is a great meal for little ones – 6 months and up – perfect for baby led weaning. There are lots of veggies. It’s high in iron and protein. 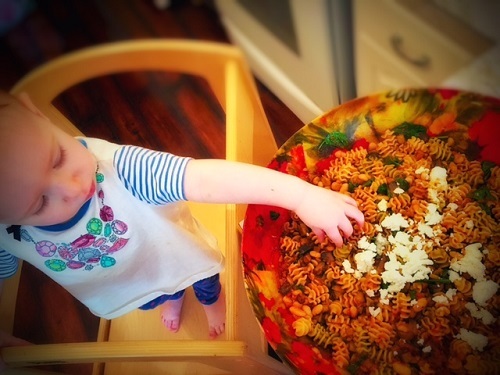 Tossed with a fun-shaped pasta, and it’s a hit! It is vegetarian, which usually gets me a Really?! 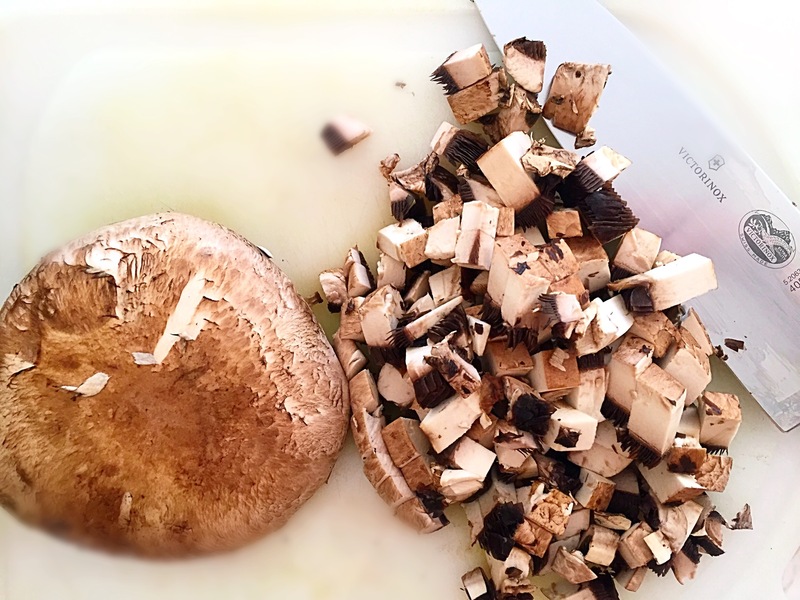 look from Stan, but he happens to like this one because the mushrooms give it a hearty flavor. You could always add a rotisserie chicken (or leftover homemade roasted chicken) if you really want meat. Otherwise, it’s a great Meatless Monday dish. Put a large pot of water on the stove to boil for your pasta. I love this organic, veggie pasta from Trader Joe’s. 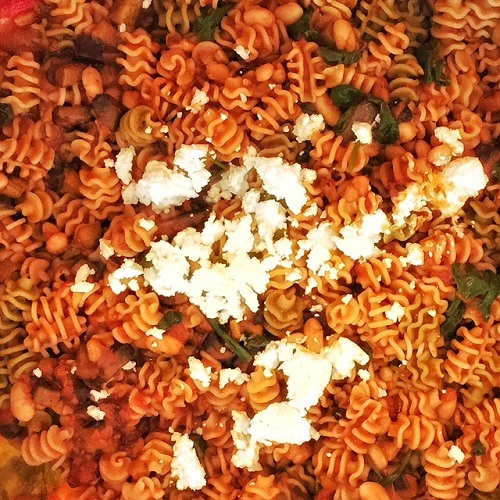 The ingredients are organic durum wheat semolina, spinach, beet, red bell pepper and paprika. Cook according to package directions. Meanwhile, chop up your onions, mushrooms, eggplant, and garlic. I leave half the skin on the eggplant, but you can leave all on or peel it all off. Personal preference. 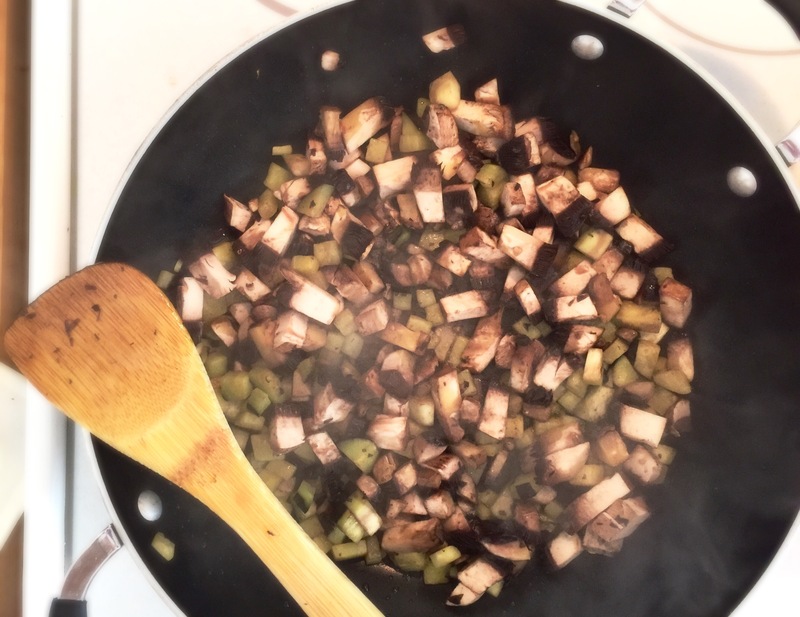 On medium-high heat, add just enough olive oil to your large saute pan to heat, but not smoke. A tablespoon or two should be fine. 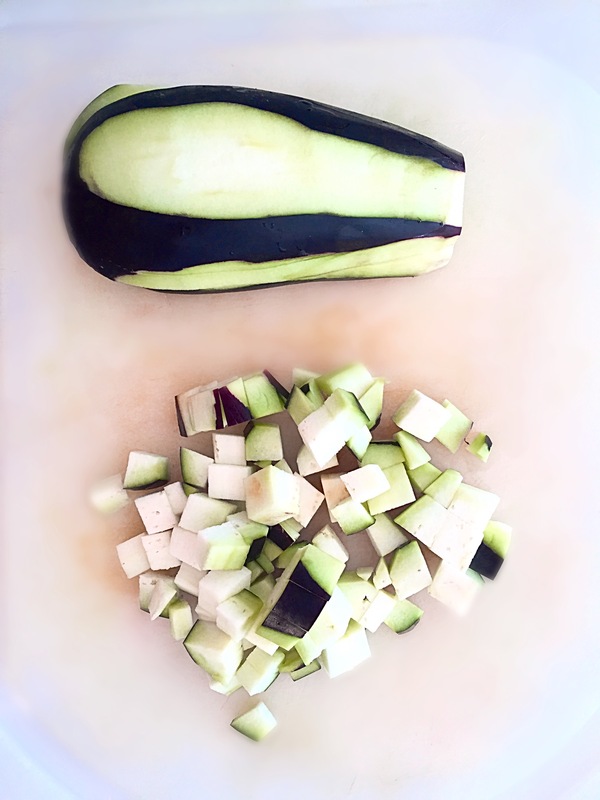 Add your onions and eggplant and toss in the olive oil. Season with a little salt and pepper and saute for 2 minutes. Eggplant is like a sponge, so you may have to add a little more as you go. Add the mushrooms to the pan, and saute until the veggies are soft. About 8 minutes total. Add your garlic to the veggies, and cook for an additional 30 seconds. Now, add the can of tomatoes to the veggies, and bring to a boil. 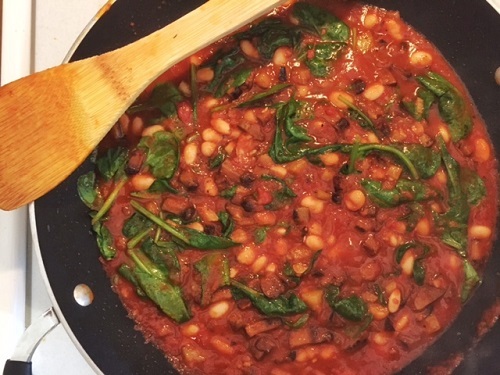 Add the cannellini beans, and the spinach, and gently stir until incorporated. Season with a little more salt and pepper, red pepper flakes, and add the balsamic vinegar. Cover with a lid, and turn the heat down to a gentle simmer. 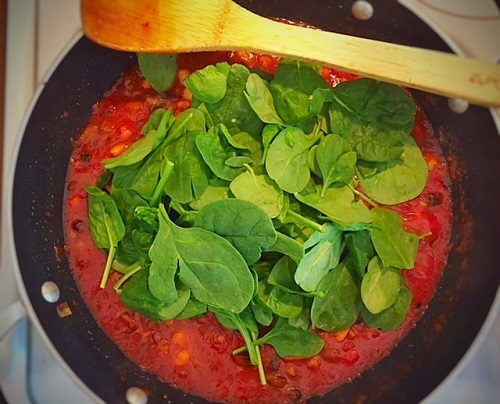 Your sauce is technically finished cooking, however, the longer it simmers, the richer your flavors will be. When the pasta is finished cooking, drain it, reserving about a cup of pasta water. 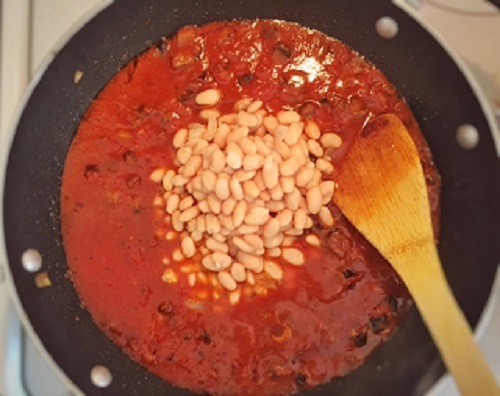 If the sauce is too thick, add a little water at a time until your sauce is the consistency you prefer. 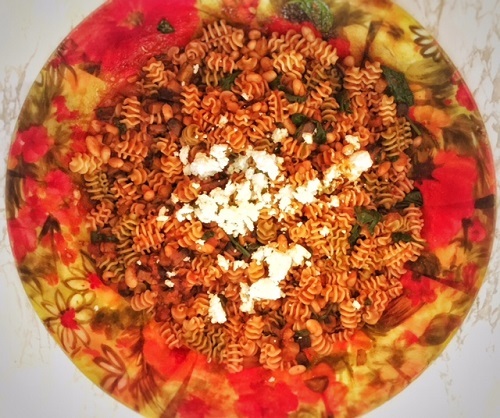 Toss the pasta and sauce in a large bowl, and stir in your crumbled goat cheese, so it’s nice and creamy. Add parmesan cheese as desired. I served this with roasted broccoli on the side, and it was a big hit. From my family to yours, I hope you enjoy! Please let me know how it goes if you do. Looks delicious! Definitely going to share with my friends who are doing baby led weaning. Yum! Wish they had the Learning Tower when my kiddo was little! Looks delish! Will have to try soon. Thanks, Jan! Thanks Deena! I hope you and the family love it!